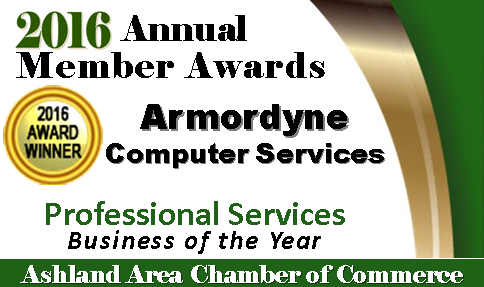 Armordyne has been serving the Ashland commuinty with a wide variety of computing services since 2000. From personal computers and laptops to business networking and trouble-shooting, our goal has always been to provide the highest level of service. In 2010, the business was aquired by its current owner, Terrence Webb. Under his leadership and with the help of a highly-trained, talented and dedicated staff of technicians, the business has grown and has achieved a reputation of dependable service and customer satisfaction. The entire staff at Armordyne Computer Solutions wants to extend their sincere gratitude to those in the Ashland community and beyond who have contributed to the success of the business. Not able to make the trip for assistance to Armordyne? No problem. We'll come to you. Armordyne Computer Solutions handles commercial and residential accounts. An Armordyne technician will come to your home or business and guide you through every step of the troubleshooting process. We'll quickly solve your problems and get your computer back to full health in no time. With our continually growing line of products and services, Armordyne Computer Solutions truly is Ashland's one-stop computer shop. We carry a large selection of equipment and peripherals that is as large as that of major retailers. One significant difference between Armordyne and big box stores is customers who go to Armordyne will find a dedicated, friendly staff eager to solve problems.